The thin layer of fudgy brownie is topped with a sticky layer of salty sweet caramel, which makes these babies addicting like crack ... not that I would know really, since I've never done cocaine, but I can imagine. 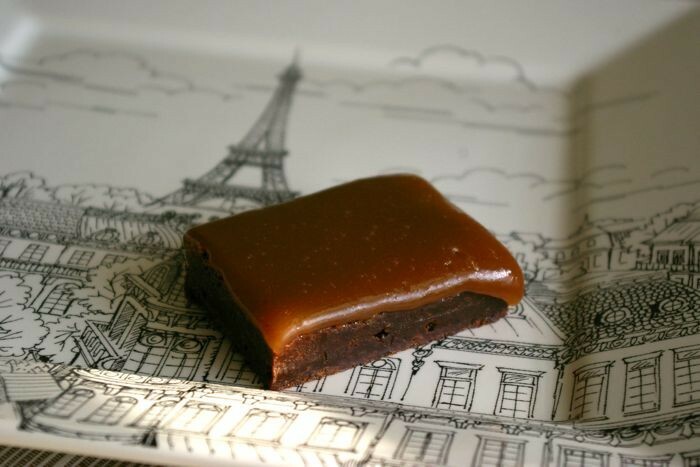 Amelie's French Bakery in NoDa has been known for their Salted Caramel Brownies since they first opened their doors. Now that I've tried this recipe (obtained via Charlotte Magazine and supplied by Amelie's) for the same brownies at home, I can make my own stash of these crack brownies and hoard them away in my fridge for when a hankering arises. 1. Be sure to use foil to line your pan. (And be sure to butter the foil well ... really well.) 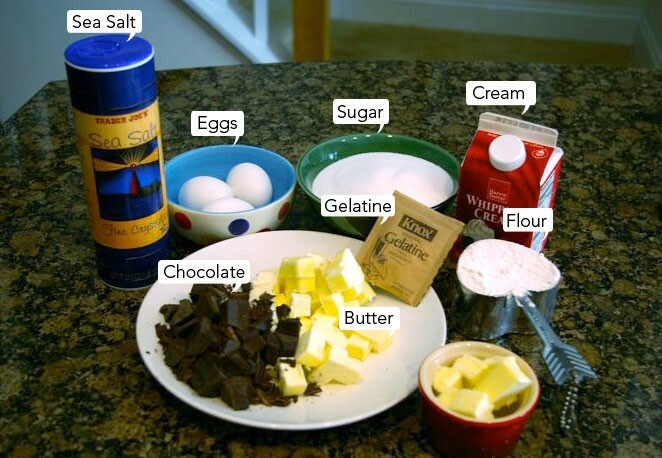 This way you can lift the entire sheet of brownies out of the pan and onto a cutting board to cut into bars, which will allow you to make cleaner cuts and make prettier brownies. 2. Do not overbake. I baked the brownies for 25 minutes and they came out just right. 3. For the caramel part, be sure to babysit the water and sugar mixture when boiling. It starts turning light brown after 5 minutes or so, and turns amber quickly after that. 4. Chill the brownies in the fridge to set the caramel. 5. If serving to guests on a platter, cut and place individual brownies in paper muffin/cupcake tin liners. Heat oven to 325 degrees F. Line a 9-by-13-inch pan with foil and then butter well. In the top of a double boiler over medium heat, melt chocolate and butter, being sure the water in the bottom of the double boiler does not touch the top pan. Stir chocolate and butter until completely melted. Then stir in sugar. Blend well. Remove from heat. In a separate bowl, lightly whisk eggs. Stir eggs into chocolate mixture. Then add flour, stirring until completely blended. Spread batter into prepared pan and bake for 25-30 minutes. Completely cool brownies in pan. Pour caramel glaze over brownies and cool in fridge until caramel sets. Slice into bars, about 2 inches square. In a small saucepan over low heat, warm heavy cream until hot, but not boiling. In a separate tall saucepan, combine sugar and water. Place over medium-high heat. Do not stir as sugar dissolves and mixture reaches a dark amber stage. Add cream, butter, and salt. Stir gently until mixture is smooth and well combined. Remove from heat and add gelatin, stirring to combine. Use immediately.